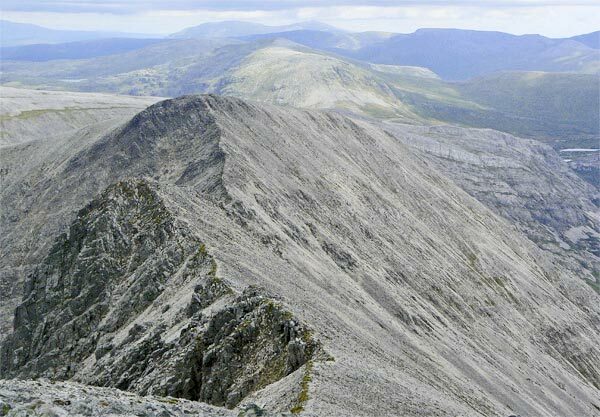 Foinavon is a large complex mountain with steep stony and craggy slopes. 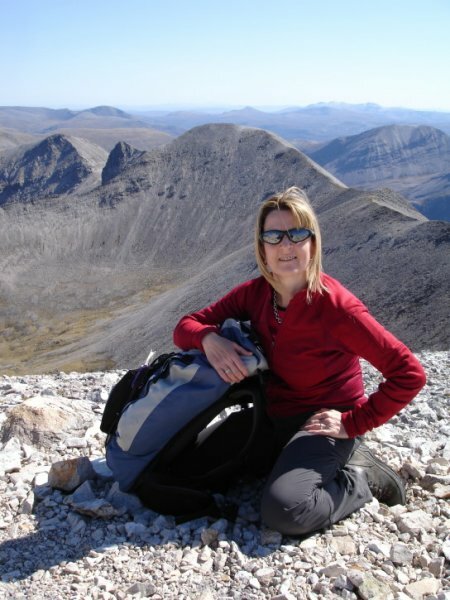 This mountain has four tops connected by a long curving ridge and its E slopes are carved into three large corries. 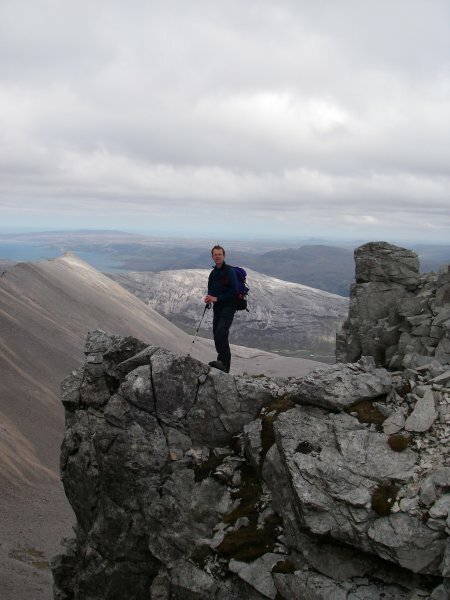 To the W, Foinaven offers a seemingly impenetrable steep wall of rock and scree. However, the S slopes facing Meall Horn (Corbett) are broad and gentle offering an easy initial ascent from Bealach Horn to An t-Sail Mhor. The traverse of the narrow ridges requires confident footwork and a head for exposure and should not be attempted by novices in wet, snowy or icy weather. On the Foinaven ridge looking south from the 869 m top towards (almost in line with each other) the 808 m top, Meall Horn in sunshine and Ben Hee in the far distance; 18th June 2007. Ceann Garbh seen from Ganu Mor; 18th June 2007. 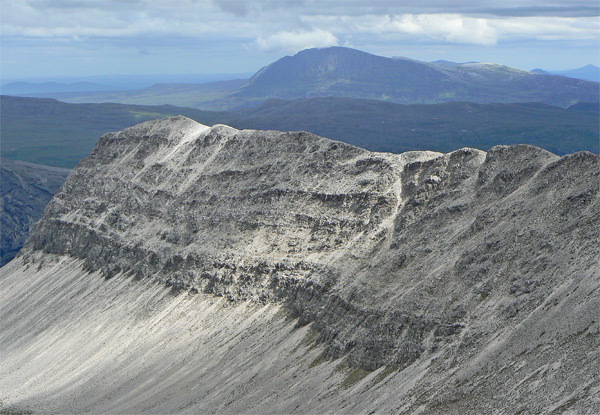 The ridge of A' Ch'eir Ghorm, with Ben Hope in the distance; 18th June 2007. 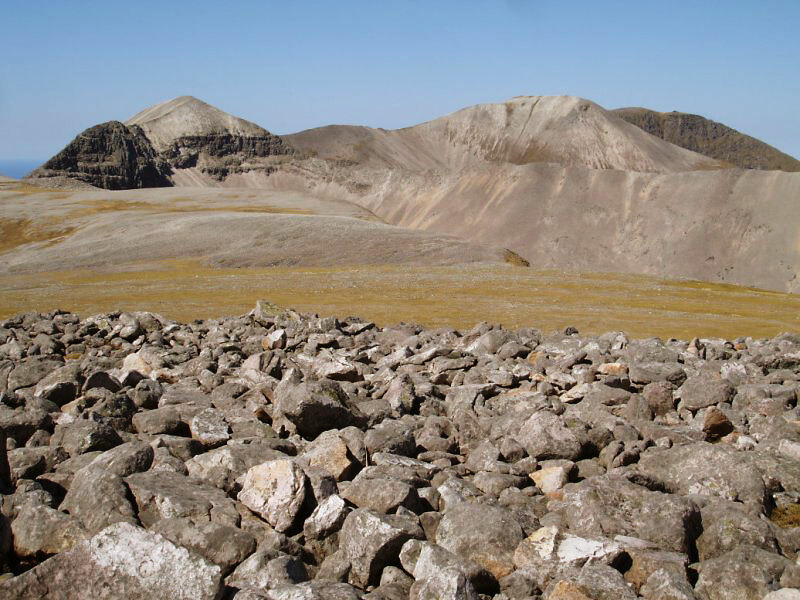 The summary information of one or more ascent routes that include Ganu Mor. Post a few words about Ganu Mor or read what others have had to say. 18th June 2007. There is space for two cars to park on the A838 near the stream at 278543. There is also space north of the bridge at 285549. We crossed the Allt na Claise Carnaich and climbed a straightforward slope, grassy for much of the way, to Ceann Garbh. 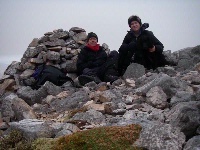 The western cairn of Ganu Mor is the higher of the two. 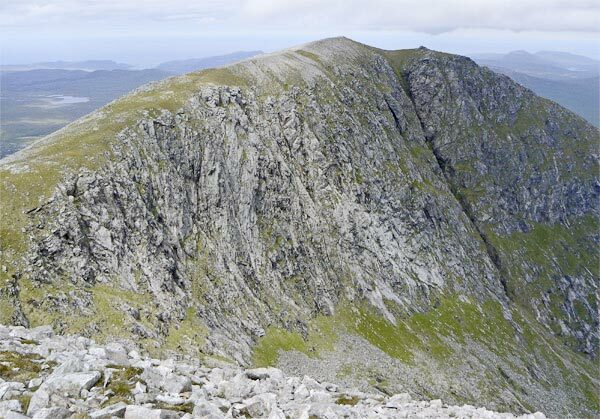 We returned to Ceann Garbh and descended by the north-east ridge. 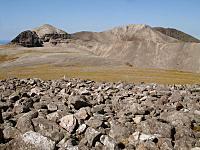 It is steeper, with large outcrops of rock. It is important to keep well to the right to avoid extensive cliffs lower down. Between our two routes on Ceann Garbh there is a grassy gully which I have used before and looks easy to follow.